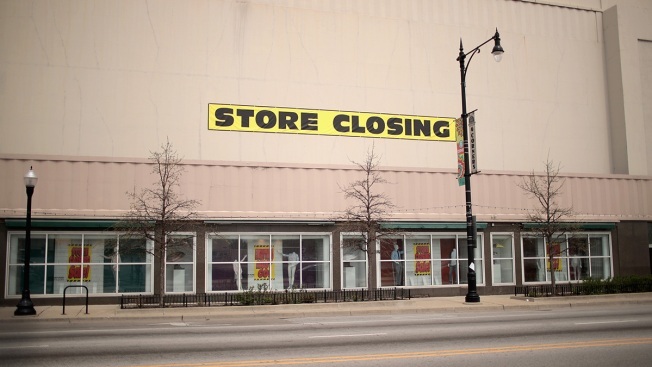 In this May 3, 2018, file photo, signs advertise the closing of a Sears store in Chicago, Illinois. UBS estimates 75,000 more stores need to close in the U.S., should e-commerce penetration grow to 25% by 2026, from 16% today. About 21,000 clothing stores, 10,000 consumer electronics stores and 8,000 home furnishing stores should close, UBS says. Clothing retailers, consumer electronics companies and home furnishing businesses will need to close more stores across the U.S. as e-commerce sales proliferate, according to UBS. In a note to clients this week, the investment firm said “store rationalization needs to accelerate meaningfully as online penetration continues to rise.” Assuming online sales’ share of total retail sales in the U.S. grows to 25% by 2026, from 16% today, roughly 75,000 more retail doors, excluding restaurants, need to close, analysts Jay Sole and Michael Lasser said. That means for every 1% increase in online penetration, roughly 8,000 to 8,500 stores need to close. A lot of that growth is being fueled by Amazon, which is expected to account for about half of the U.S. e-commerce market. Within that 75,000 number, about 21,000 clothing stores, 10,000 consumer electronics stores, 8,000 home furnishing stores and 1,000 home improvement stores should close, UBS estimated, based on the firm’s assumed growth rates of online penetration within each retail subsector. It added about 7,000 grocery stores could close if online grocery penetration rises to 10%, from 2%, by 2026. UBS also analyzed the productivity of stores across the country, which it said accelerated through 2018, based on the amount of sales made per store. Already this year, more than 5,000 store closures have been announced by retailers, according to a tracker by Coresight Research. They include Gap, Victoria’s Secret, Charlotte Russe and Gymboree — notably many clothing companies.